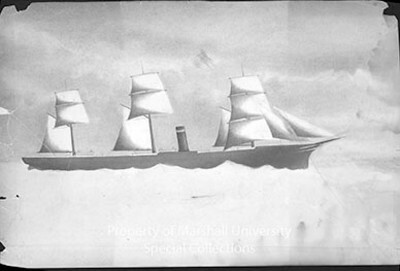 Pencil sketch of the CSS Alabama, by a member of the crew. (The crew member is unidentified.) It is dated 1863. While the ship was being built in England in secrecy, it was known as “ship 290.” The Alabama was the most famous Confederate warship, and literally traveled the world boarding almost 450 ships, and capturing or sinking 65 US ships until sunk near Cherbourg, France, June 19, 1864. Ca. 1863, item # 2006.0703.260, 42 x 28 cm.